Albums and Albertine : Reform worship. I frequent Bob Kauflin's blog, WorshipMatters. His latest entry is "Listening to Music - Erosion or Accumulation?" In it he quotes Russ Bremeier of Christianity Today and what he has to say about two kinds of music albums: 1.) the ones that "erode" with time and 2.) the ones that "accumulate" your liking. As I was reading, and before Russ mentioned this particular album, I was thinking to myself, "You know, I really like Brooke Fraser's album Albertine." Then, sure enough, he names that album as an "accumulator". Then, as Bob was commenting on Russ' note, he confirms Albertine as one that has accumulated his liking over time. And before I read Bob's last paragraph, I thought to myself, "I bet Bob is going to say something about the lack of gospel content in Brooke's album," and he does. I bought the album for my wife a couple months ago, since she is a big fan of Hillsong United, and Brooke Fraser is one of their worship leaders. (BTW, I buy my Praise & Worship CDs from www.goldusa.com. You should check it out. If you can find lower prices for CDs, let me know.) I have listened to Albertine at least twenty times and absolutely love the artistry. This doesn't happen very often, but I liked it the first time I listened to it, and it has grown on me even more over time, especially musically and poetically. And like Bob says, the lyrical content is less gospel-centered and more typical Hillsong depth (although her songs are not meant for Praise & Worship). This doesn't bother me, though. I simply noticed it, as did Bob. If you love leading Hillsong songs, and you're wondering what I mean by "typical Hillsong depth," Bob pretty much nails it when he says, "When it comes to songs for corporate worship, I haven’t been a big Hillsong fan. Their songs can tend to be strong on the music side, weak on the lyrical side, and heavy on the subjective side." And if you're still wondering what that means, read my series of "Contemporary Praise and Worship" posts. 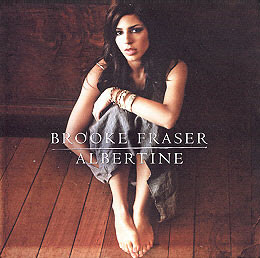 Regardless, I highly recommend Brooke Fraser's Albertine.